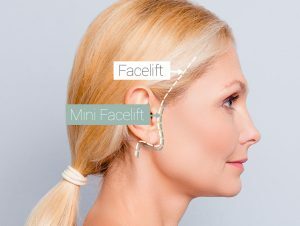 If you are interested in mini facelift surgery, we invite you to read through this page that has been designed as a patient resource. Information you may find helpful includes candidacy, procedural details, and what to expect in the results. Should you have any questions, or if you wish to schedule a consultation, feel free to contact us, and our team would be more than happy to assist you. Patients who exhibit the beginning signs of aging, such as mild facial sagging in the form of jowls and marionette lines, tend to be good candidates for the mini facelift. Typically, patients between ages 30 and 50 receive the most benefit from the procedure, but older patients can often reach their goals through the procedure as well. The mini facelift can provide a more youthful, refreshed appearance with a shorter recovery to help you feel more confident. While it will not provide a drastic new look, it will rejuvenate your appearance as it once looked. It is important to note that the surgery cannot remove fine lines and wrinkles, but additional treatments, such as a facial peel or laser skin resurfacing, can be done to address these concerns. Like any procedure, our surgeon emphasize the need to have realistic expectations. During your consultation, you will have the chance to discuss what you hope to achieve with your surgeon. When you come in for your initial consultation, your surgeon will conduct an exam of your facial skin and its structure (muscle, bone, and fat quality). He will also discuss what you hope to achieve through surgery and whether you are a candidate for a mini facelift. Dr. Zemmel will also assess your medical history to determine if you have any conditions that may either complicate your surgery or the time following. Such medical problems may include high blood pressure (if not under control), difficulty with blood clotting, or being prone to excessive scarring. Please inform your surgeon if you are a smoker or are currently taking any medications, especially blood thinners like aspirin. When you opt to have a mini facelift, your surgeon will explain his technique, the anesthesia he will use, the facility where the procedure will be performed, the risks involved, and relevant costs. Do not hesitate to ask questions or express any concerns you may have, including those related to your expectations and the results you hope to achieve. Despite the body’s natural aging process, undergoing a mini facelift can help you age more gracefully than if you never had the procedure at all. You will be given instructions on how to prepare for surgery, which will include information regarding what you can eat or drink, details about smoking, and whether you should take or avoid certain supplements or medications. By following these guidelines, you can experience a more predictable, problem-free surgery. Make sure to arrange for an adult to drive you home after your surgery and to assist you during that night. Dr. Zemmel performs mini facelifts at St. Francis Hospital’s Ambulatory Surgical Center. Facelifts are done on an outpatient basis. Frequently, our plastic surgeon will admit patients overnight to the hospital for monitoring, depending on the patient’s aging and the duration and complexity of the procedure. Dr. Zemmel always calls each patient personally at night to ensure their safety. You will be seen that next day at the office to take down the surgical dressing… and a first glance at your new look! Unlike most other facial procedures, mini facelifts can be performed under local numbing anesthesia alone. Occasionally, a mild sedation (“twilight”) anesthesia may be used. Mini facelift surgery takes approximately one and a half hours to complete. Your surgeon will begin the procedure by placing an “S”-shaped incision in front of the ears. This incision begins at the sideburn area, continues in front of the ear, goes behind the front cartilage, and ends behind the earlobe. The incision is placed strategically in these areas to easily conceal any future scarring. Once the incision is placed, the skin is separated from the underlying tissues, and excess skin is removed. Depending on your needs, your surgeon may perform the SMAS technique, which repositions the deeper layers of fat and muscle for a more in-depth rejuvenation. Stitches are then used to close the incision and secure the area. Your surgeon will then apply a light dressing to the area for protection as you go into recovery. When a mini facelift is performed by a qualified plastic surgeon, complications are infrequent and usually minor. These rare complications include: hematoma (a collection of blood under the skin that must be removed by the surgeon), injury to the nerves that control facial muscles (usually temporary), infection, problems with skin loss and wound healing issues, and reactions to the anesthesia. Our surgeon at Richmond Aesthetic Surgery will instruct you how to reduce your risks of complications before surgery and will provide you with a full set of instructions after surgery as well. After a mini facelift, discomfort is typically mild. Prescription pain medication can be taken to control any pain or discomfort. It is normal to experience slight numbness in the area, though this should disappear within the first couple weeks. Bruising and swelling are typically minimal and should fade as you continue to heal. To ensure your recovery goes smoothly, your head should remain elevated. You will return the first day after surgery for your dressing to be removed. At this point, you can shower and cleanse the area. Five days post-operatively, your stitches will be removed at our office. A major benefit that results from the less invasive nature of the mini facelift is the little downtime required after your surgery. In fact, most patients report feeling like themselves again within the first couple days. More detailed instructions will be provided when you come in for your appointment, giving you a better idea of when you can resume your normal routine. Dr. Zemmel is a excellent doctor. My recent experience was absolutely wonderful! All his staff was super nice. The whole office was very clean!! I sung his praises to My PCP and gave her all his contact information so she can refer furture patients. The best advertising is word of mouth of a very happy satisfied patient!! Following your mini facelift, you can expect to see a rejuvenated, more youthful appearance. Since the procedure results in little bruising or swelling during recovery, patients can begin to see their outcome within the first week. Like any surgery, scars will be present after your mini facelift. However, the incision placement allows you to easily conceal scars, since they are made in the natural creases around your ears. Over time these scars will fade and become less noticeable. Although a mini facelift cannot stop the aging process, it can take years off your appearance. To maintain the youthful results, many patients return years later to have another mini facelift or traditional facelift performed.